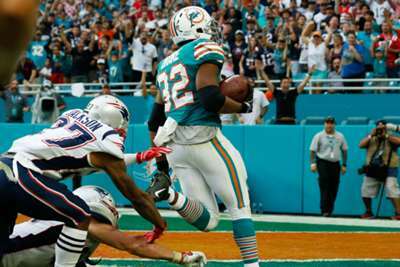 Rob Gronkowski bemoaned his inability to make a game-saving tackle as a last-gasp miracle touchdown handed the Miami Dolphins an incredible victory over the New England Patriots. The Dolphins' hopes looked to be all but over when they got the ball back trailing 33-28 with 16 seconds left. But chaos then ensued as Kenny Stills caught a pass from Ryan Tannehill before pitching it to DeVante Parker, who then in turn passed to running back Kenyan Drake. Drake burst through a gap in the Patriots' scattered defense before rounding Gronkowski and surging into the endzone to complete a play already known as the Miami Miracle and leave the Patriots devastated. Gronkowski stumbled in his unsuccessful attempts to tackle Drake and told a post-game media conference: "We've practiced that play a few times for the Hail Mary, you guys have seen it before, just go up and get the ball. "They changed it up a little bit and I did sucky. You've got to be ready for anything, it's football, the way it ended, it sucked. "[I have] never really been a part of anything like that, [I] feel like it's going to test our character big time, how we bounce back from something like that, just got to make that tackle. "I did trip a little bit but that's football, that's why they say it's a game of inches, game of a split second here and there, that just gave me a lesson that it shows that's true." Asked for the reasoning as to why star tight end Gronkowski was on the field with the defense, head coach Bill Belichick said: "Well, they could throw it deeper [where Gronkowski was positioned to knock the ball down]. "They could have run the Desperado-type play, which is kind of an in between 20-yard pass, then it turned into a Desperado. "There's a lot of things we could have done better. It came down to one play but there were a lot of things besides that. In the end we've just got to do a better job than we did. Miami played hard like they always do, they just made one more play than we did."